Macedonian Alumni Mr. Mitko Chavkov became Minister of Internal Affairs in May 2015. Minister Chavkov participated in the 34th core course in 2002. One of his class members was Lt. Col. Gábor Tompa, ILEAs current training coordinator for specialized courses. Mr. Chavkov visited ILEA in July 2015, to celebrate our 20th Anniversary. 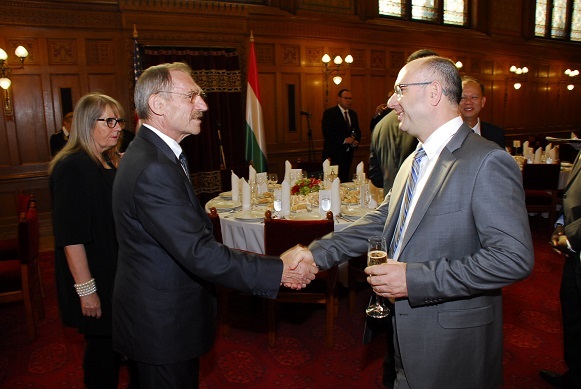 During the two-day anniversary events, Mr. Chavkov had a chance to meet some of his old ILEA friends, including ILEAs "grandfather", Hungarian Minister of Interior Dr. Sándor Pintér. "We appreciate all staff continuity in ILEA and lecturers who trained us with dedication and conveyed to us their professionalism and excellent experience in the fight against terrorism, organized crime, illegal trafficking, etc. All the knowledge received in the course ILEA session 89 and experiences exchanged with colleagues were implemented and turned procedures in our work and exchanged with our colleagues in our jobs, who served continuously in work and the challenges of their professional experience and knowledge that have been assessed by our superiors." "Courses helped me a lot in improving the efficiency in the work. Since the end of the course, I found five cases of smuggling of drugs in especially large quantities. Thank you! I would like to continue studying!" "I consider myself a "success story" as a result of training received. On the one hand, the information assimilated and shared my colleagues gave me their respect and admiration, on the other hand in ILEA experience and ambition led me to want to experience more of this area." "Crime has no boundaries. Police should follow the same. If someone understands this approach, that is ILEA. Invaluable experience to meet colleagues with whom we can contact and exchange information, which is a huge time saver and a variety of bureaucratic obstacles, but also the experience of knowledge and skills! All praise ILEA for the unforgettable experience!" "Since we are members of the class of 94 that are relatively completed only a few months ago, we were still able to take part in a serious case where we could apply what we have learned at the Academy ILEA. But a lot of things we learned at the academy already apply in their daily work, such as the Leadership and Management." "After training in ILEA, I was promoted to the position of Head of criminal police in my hometown, such as two years’ work. I achieved best results in the work of the management for the past 10 years; I was the youngest employee, who led 25 people. I continue to train my employees and subordinates in criminal police Dimitrovgrad.... Thanks"
"I want to mention that I have on several occasions used the technique for undercover operations, where I was working undercover operations using the techniques learned in the ILEA Academy. Next I want to say, to maintain friendships gained at the academy, and on several occasions I was exchanging information with police officers from the Croatian who were with me at the academy, and that information resulted in the successful resolution of some of the crimes." "I had a number of cases where my training in ILEA made a great contribution in the investigation of criminal offenses, and where I gained knowledge from the training used for identification and qualification of certain crimes." "Proud to be your member! Thank you!"